What organizations really need is guidance on how to best position and implement new learning technologies, which might be a game or some other type of new learning experience. According to Karl Kapp, games work best when embedded into a larger blended learning curriculum. This sounds logical enough, but it is much harder to decide exactly what that curriculum should look like. Fortunately, many organizations have already successfully implemented games into their training. One of the best ways to prepare for a game-based learning implementation is to learn from the success of others. I had the chance to work with four organizations who have been using Knowledge Guru as part of their training programs. These organizations come from a variety of industries (technology, financial services, healthcare) and used the games within diverse functional areas (new hire training for sales reps, product knowledge for sales and support reps and process training for HR associates). What’s interesting about all four implementations is just how similar they are. These organizations independently made many similar choices when implementing game-based learning. The results they achieved speak for themselves. If you saw me present at DevLearn 2015 or ATD International 2015, you have already heard these case studies. Congratulations! You’re ahead of the game. For everyone else, you’ll have another opportunity to learn about how Cisco, Johnson & Johnson, Salesforce Marketing Cloud and a Fortune 500 Financial Services company approach game based-learning in my upcoming webinar with Training Magazine. I’ll explain all four case studies in depth, then share seven implementation tips based on what these organizations’ implementations have in common. If you’d rather skip the case studies and get to the point, you need not wait till November 17th. 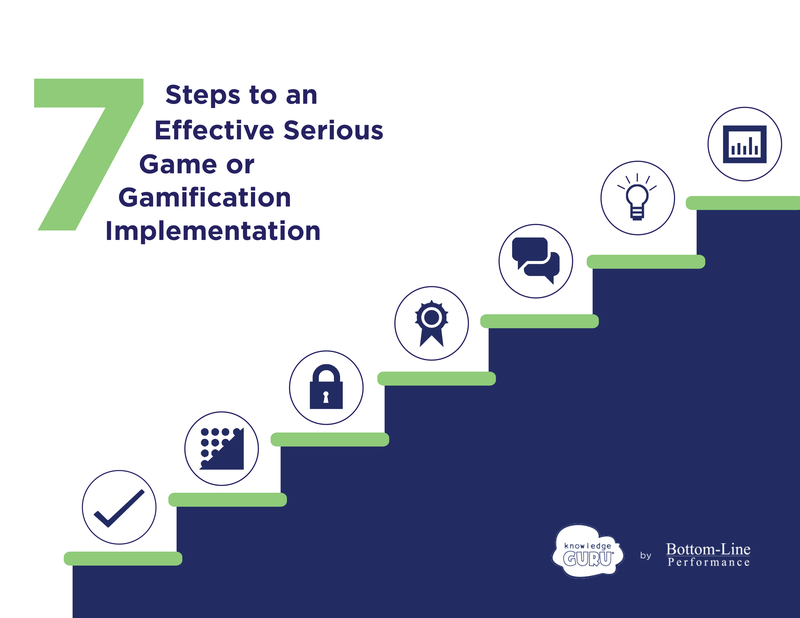 I share my seven implementation tips in a new white paper, 7 Steps to an Effective Game-Based Learning or Gamification Implementation. I hope you’ll join me for the webinar, have a look at the white paper, or perhaps do both. Are you a do-it-yourselfer? When it comes to serious games, ATD says you probably are. In an ATD survey conducted for its 2014 research report, Playing to Win: Gamification and Serious Games in Organizational Learning (link), 71% of organizations reported that they prefer to develop serious games in-house. 83% said they planned to develop gamification in-house. I’d say that’s a confident group! In the same survey, only 20% of organizations were already using serious games for learning, while 25% were using gamification. That means most organizations have never used games for learning before and plan to do it without help from a vendor. One of the reasons serious games are hard to create successfully in-house is the lack of game design skill most organizations have on their teams. 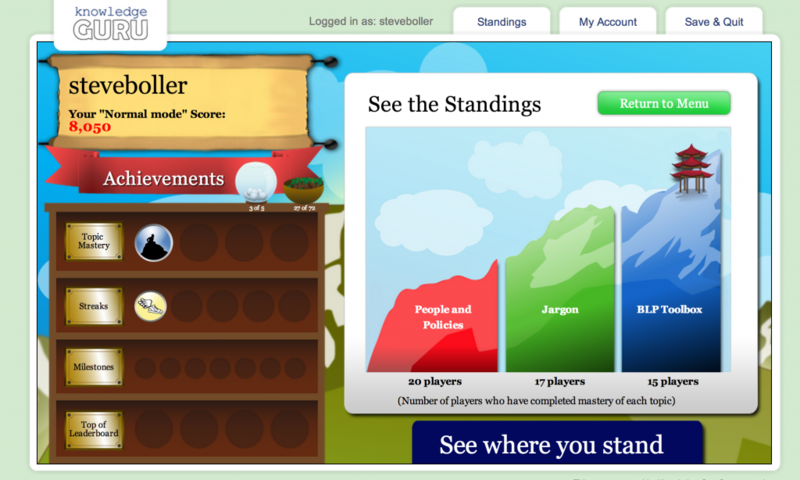 Your instructional designers may be good, but have they played lots of games? Have they designed games before? Many instructional designers continue their education and earn masters degrees in instructional design. 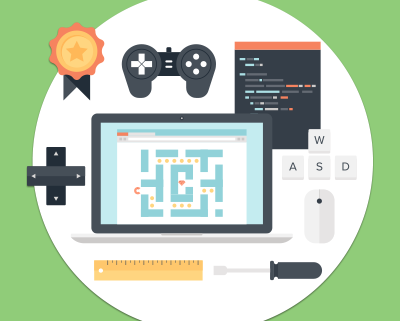 Can you master game design by taking a one-day workshop? Organizations often get around the lack of in-house game design expertise by using game templates or a full fledged gaming platform. When the platform you use already has gaming built in, all you have to do is think about your content. 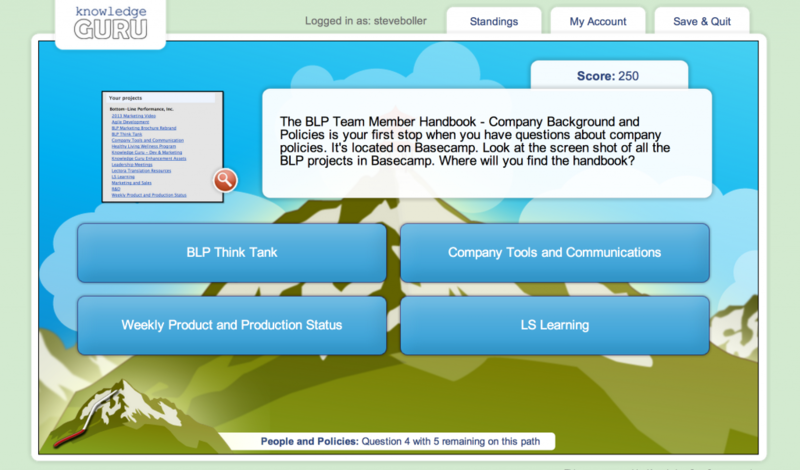 A platform can make life much easier for your team… but creating the game itself is less than half the battle. You still have to implement your game. And that’s where things really get interesting. No matter how fun your game-based solution is supposed to be, you will still need a plan for launching it, promoting it, and measuring it. How will you communicate about the game? Will you require players to play? How will you incentivize play… or do you need to incentivize? 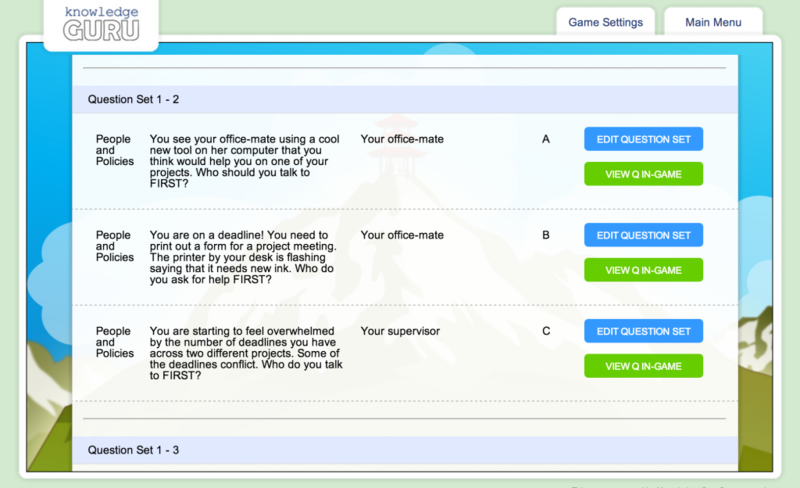 These are all questions you must answer as you implement a serious game or gamification initiative. In my role, I get to collect stories from organizations who wish to submit for industry awards. These are typically the “best of the best.” They planned for success, either partnered with us to build a solution or created their own game with Knowledge Guru, and drove meaningful business results from their efforts. What’s interesting about these award-winning implementations is just how similar they are. I find that the companies that are most successful with games and gamification in their organizations take many similar approaches when it comes to implementation. Let’s face it: employee time is limited, and most of us only have the energy to focus on the activities that are truly essential to our jobs. Even if your serious game is fun, is it equal or greater than the myriad of entertainment options available to us around the clock? 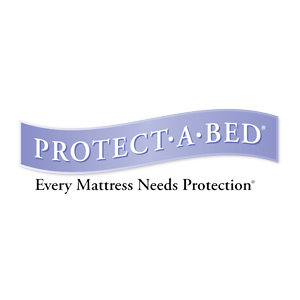 Our experience shows us that the organizations that are most successful with serious games require play. 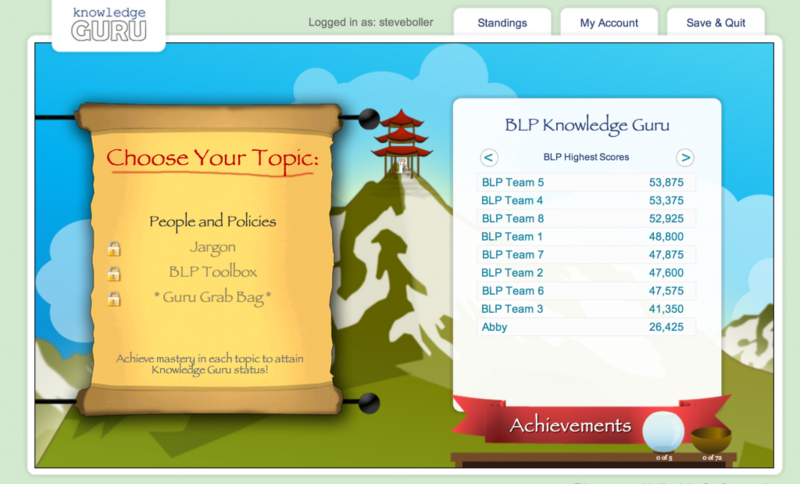 For example, Johnson & Johnson has integrated Knowledge Guru into employee goals & objectives for the year. 2. Blend into a curriculum: use as part of a learning solution. You probably have lots of training initiatives happening in a calendar year. Games might be a great addition to the mix, but you should not plan to replace all of these existing training events with games. The case studies I have gathered all show organizations having the most success when games are part of a larger blended curriculum or strategy. This allows you to narrow the focus of your game to cover a specific skill or set of knowledge. 3. Use the game as a reinforcement (most of the time). 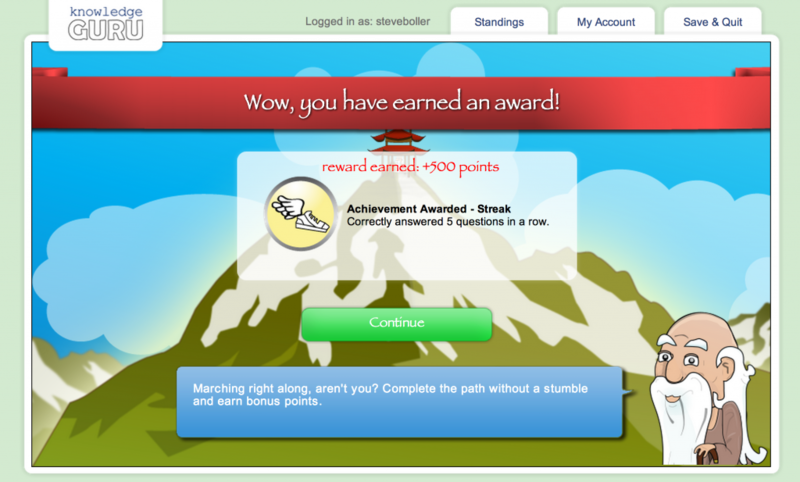 Games and gamification make great reinforcement tools. In fact, most organizations we have worked with position games as either a reinforcement, or a motivating first exposure to content that will be covered in greater detail later. 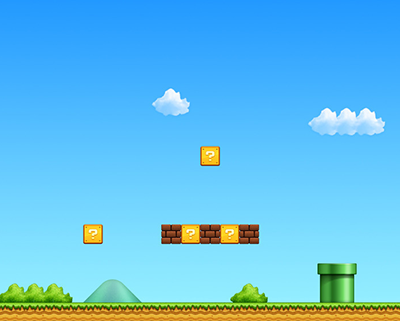 It is also easier to launch a game as a reinforcement when you are attempting your first go-around with serious games. 4. Offer incentives and/or provide sufficient motivation. No matter how you dress it up, completing a serious game is still training that is part of a job. 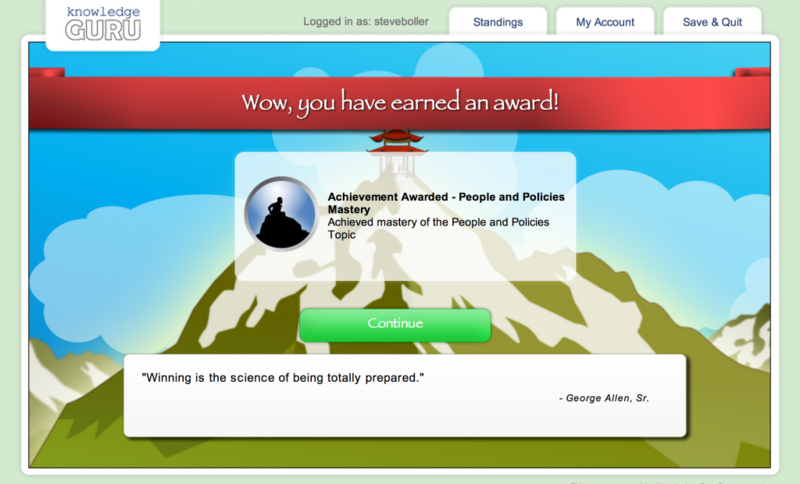 Unless your learners are highly intrinsically motivated, we recommend providing prizes and rewards. Encouragement from senior leadership can be even more effective. The grand prize winner of a Knowledge Guru game hosted by one of our Financial Services clients specifically cited how meaningful it was to be recognized by company leaders as part of winning the game. 5. Create a communications strategy around the game. Learning and Development leaders need to think more like marketers when implementing all types of training. Every single case study I have seen of a successful Knowledge Guru implementation incorporates some sort of multi-part communications strategy to get the word out about the game. 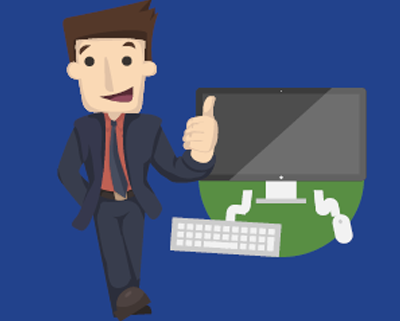 This could include many things, from advertisements in a call center to a series of emails or even a collection of advertisements placed throughout a company intranet site. 6. Use reporting and adapt the training. Most organizations first get interested in games because they want to motivate or engage their employees. This is only part of why games are powerful organizational learning tools, though. 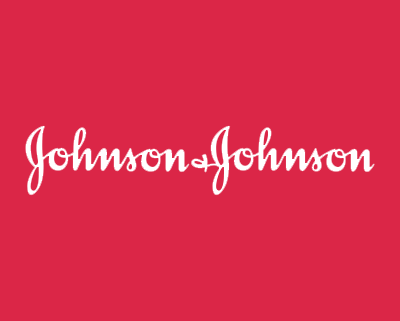 For example, Johnson & Johnson was able to identify a specific learning objective that learners were missing as a group, then adjust their overall training to better focus on the weak process step. The organizations that are successful with serious games and gamification take advantage of the data they gather on learners and act quickly to adapt their training and processes. 7. Gather insights via surveys. 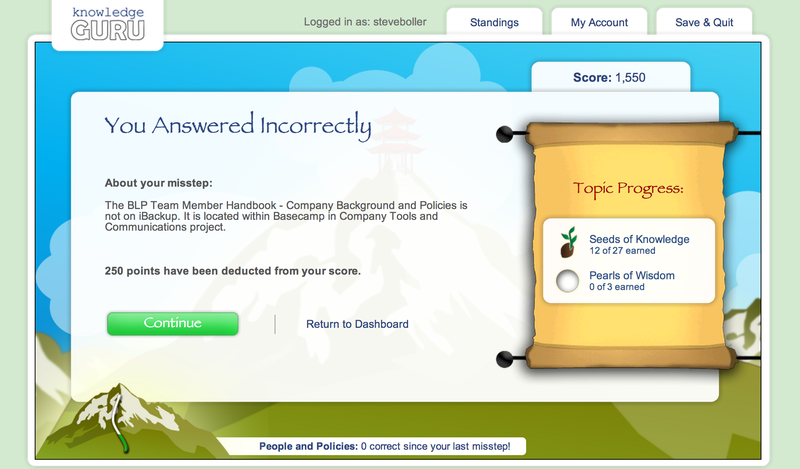 It is not uncommon to survey learners after a training initiative is completed… especially after a pilot. Games are no different. The surveys conducted by Knowledge Guru customers have revealed many valuable insights that impact future games. In one survey, a player commented that they learned a more effective way to do their job through the game that had not been covered in company-wide training. Our client was able to take this information and launch new training to teach the effective process to the rest of the department. 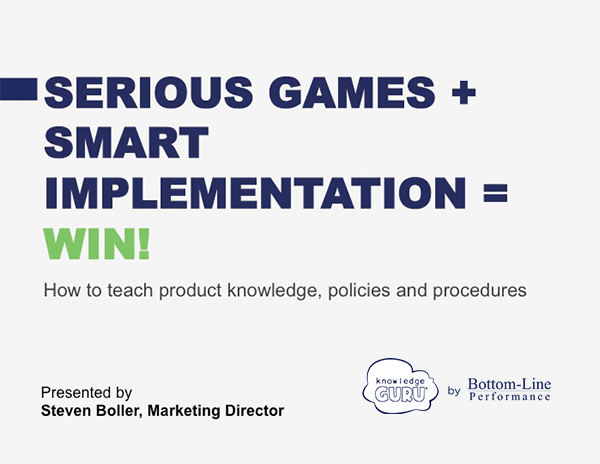 Want to learn more about how to implement effective serious games? I cover these implementation tips in the recorded webinar below, adapted from my ATD International 2015 presentation. You’ll also see four case studies from organizations that have implemented a serious game that drove real results. Access "Serious Games + Learning Science = Win"